Here is another fall hunting update for those who have been asking me to stay in touch with you concerning our hunting success and how things went with Customs officials, etc. in Russia this year. Well . . . in a word the fall hunts have been AMAZING! That’s one of the words most often used by our hunters this fall. Our latest moose hunters were no different! “Our hunt lasted a total of two hours,” says Greg Cesario who took his son on a hunt of a lifetime this fall. What happened is they jumped a big bull and Greg’s son, Kody, opened fire, hitting the moose. While Kody and his guide went after the wounded bull, three more bulls busted from cover. Greg opened up on what he thought was the biggest of the three and put it down. Then he realized the guide was trying to get him to shoot one of the other . . . bigger . . . ones. Greg wound up shooting a 50 inch class, Alaskan size moose, with nice paddles. 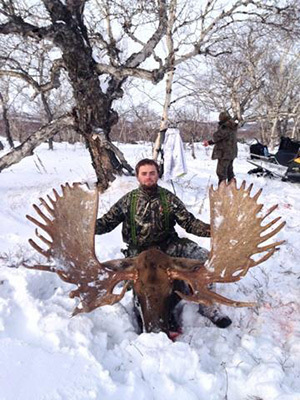 His son, Kody, whacked a monster moose with a 65 inch spread. But, it’s not the spread that was the outstanding feature of this bull. It was the many huge, long points and big front brow tines and huge palms. This bull (see photo) will score very high in the SCI World Record Books. And so Cesario and his son are coming back. They have already reserved 2017. If anyone else wants to get in on one of our outstanding moose hunts we have two spots open for 2015, and two for 2016. Any questions, give me a shout! I am writing to let you know what a fantastic moose hunt my son Kody and I had in November 2014. This was Kodys first time hunting out of the country and needless to say, we were both worried and very wary of all the paper work and permits required for the hunt. We were worried for nothing. Your network of people ensured all of our paperwork, permits, and document requirements were in order before we left. Upon our arrival in Moscow, we were met by Andre who was with us throughout the entire trip. He was an absolute delight and is a wonderful representative for your group. He was waiting for us and took care of every single step in the process. He secured our firearms, dealt with all the customs issues and ensured we were on our way quickly and easily. He had a warm taxi waiting for us and whisked us away to a wonderful hotel. The staff at the hotel was warm and accommodating. Once at the hunting camp, everything was planned in advance for us and went smoothly. In Kamchatka, Andre, Val and the rest of the group immediately helped us settle in and made sure we were comfortable. Kody and I were very pleasantly surprised to find a full time chef at the camp. Chef Michael cooked the most delicious meals! This was unexpected, but greatly appreciated. The hunting guides were superior! Their knowledge and skill ensured us a quick and successful hunt, maybe too quick. Kody and I both filled our tags on our first day out. In fact Kody may make “THE BOOKS” with the monster bull he bagged. Both Kody and I would like to thank your entire organization for this wonderful hunt. Everything from point A all the way to point Z was first class. This trip definitely exceeded all of our expectations. Given the chance, we wouldn’t hesitate to do it all again. Please feel free to have any potential customers contact me with any questions, for I would have only the highest of praises to share about our experiences.